BENGHAZI, Libya—It has become a platitude to say that Libya’s rebellion differs significantly from the uprisings in Egypt and Tunisia. Indeed, it does. The regime’s unwillingness to show any restraint rapidly turned the protest into an armed revolt, and as the casualties increase so too does the level of international outrage, and with it, the possibility of Western military intervention. However, what’s lost in Euro-American debates over a no-fly zone is the fact that Libya’s Feb. 17 revolution began as a peaceful and leaderless popular uprising. Its primary demands were — and remain — almost identical to those of the majority of protesters in Tunisia, Egypt, Bahrain and Yemen: freedom of expression, democracy and the ousting of a dictator and his repressive security apparatus. In a context like Gaddafi’s Libya (or Mubarak’s Egypt and Ben Ali’s Tunisia) where even the smallest act of dissent means time in prison and torture, these fundamentally liberal demands take on a far more radical hue. If Egyptians were stunned that 18 days of mass peaceful protests could oust Mubarak, the euphoria of shaking off Gaddafi’s control came even quicker in the restive cities of Eastern Libya. After just four days of demonstrations and violent clashes, Benghazi, Al-Bayda, Derna, and Tubruk, one by one, all declared their liberation from over four decades of iron-fisted rule. As Gaddafi’s forces withdrew or surrendered, unarmed protesters destroyed every symbol of the hated regime; burning down police stations, the torture chambers of the internal security forces, and, in Benghazi, the fortress-like barracks that housed Gaddafi’s brigades. But with the lightning speed of an unimaginable victory came unprecedented responsibilities. Within days, lawyers who had been agitating for relatively minor legal reforms were suddenly thrust into the leadership of a popular rebellion that became headquartered at a courthouse in Libya’s second-largest city, Benghazi. Among them are outspoken human rights advocates like Fathy Terbil and the spokesperson of the Provisional National Council, Abdel Hafiz Ghogha. Terbil represented the victims of one of the Gaddafi regime’s most notorious crimes, the massacre of 1,200 inmates at the Abu Salim prison in 1996. His arrest on Feb. 15 sparked the initial protests in Benghazi. Many of the figures on or close to the council have, at some point, publicly questioned Gaddafi’s policies and the terror of his revolutionary committees — and, in some cases, paid for their dissent with long prison terms. The new leaders of Libya’s rebellion do not represent any single ideological position. What they do share, and this is a failing that many of the council members in Benghazi readily acknowledge, is that few of them have any experience with politics, governance or popular mobilization. That’s not surprising given that one of the key achievements of Gaddafi’s 42 years in power has been the systematic annihilation of civil society. Any effort toward community or labor organizing or building political associations was swiftly and brutally stamped out as an unacceptable form of dissent, punishable, in some cases, by death. 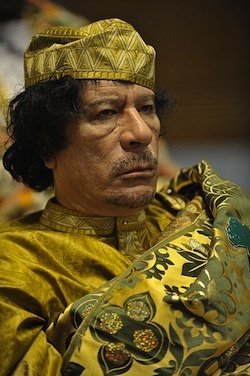 Notwithstanding his son Saif al-Islam’s much-touted PhD dissertation at the London School of Economics on the role of civil society in democratization, Gaddafi said in a televised address last year that civil society is a bourgeois invention of the West with no place in Libya. Labor unions, he added, are for the weak. Filling a political vacuum this expansive will not be an easy task for the newly formed council that is still grappling with the reality of a hopeful pro-democracy uprising that has morphed into a war they might very well lose. Although the East was quick to fall from Gaddafi’s control, there’s a pervasive fear that their gains might be easily and brutally reversed. Already eastern towns are squeezed for food and medical supplies, all of which usually originate from Tripoli. Increasingly, there are reports of infiltration by suspected pro-Gaddafi elements. Most significant, few rebel leaders have military experience. While the rebel army has some defectors from Gaddafi’s forces, it is largely composed of untrained young volunteers eager to help their compatriots in the heavily bombarded towns surrounding the capital city of Tripoli. As they were routed from the oil city of Ras Lanuf and other coastal towns stretching east to Benghazi, most remain bitterly aware that they are in for a bloody fight against a far better-equipped opponent. Hospitals in the East are reeling from the flood of patients bearing wounds from heavy-caliber weapons. One doctor in Al-Bayda, who had been in Gaza during Israel’s Operation Cast Lead, described the scale of the injuries during the first few days of the uprising as similar to what he had witnessed in Gaza. As the casualties rise in the besieged towns of the West as well as the frontline towns in the East, some estimates place the numbers of dead in the thousands. This is the context in which Libyans are calling for a no-fly zone. They know full well that a no-fly zone won’t necessarily clinch the battle for them and could backfire. Like the courageous protesters throughout North Africa and the Middle East, they want the victory to be their own, achieved without outside help. Everywhere in the East, large banners oppose foreign military intervention. But as the death toll rises, the Libyan call for a no-fly zone is a desperate attempt to buy time. Anjali Kamat is an independent radio and print journalist and a correspondent for Democracy Now!.